If you are considering changing old metal fillings for amalgam alternatives / a metal free restorations or or simply contemplating the best option for a new filling that needs to be carried out then the information here can help you to understand your choices better. Essentially the 2 main metal free choices are composite resin restorations or porcelain Inlays. We have been providing both at our dental practice in Edinburg for many years. 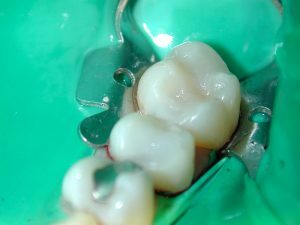 This page tells you all about each option scroll down to read all about composite fillings and then porcelain inlays. Composite resin restorations also known by many as white fillings. They are a fast and effective substitute for dental amalgam restorations. When placed under optimum conditions they can have an excellent lifespan and be a great material to restore your teeth. The composite resin is chemically bonded to your tooth which effectively seals the cavity and prevents the bacteria present in your mouth percolating around the restoration. 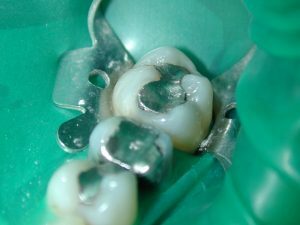 This alone is a technical advantage over amalgam fillings which are known to suffer from microleakage for the first few weeks after placement. Thankfully today we have improved materials, protocols and techniques to minimise the effect of the shrinkage. By layering fillings and using, multiple small increments we can control the shrinkage and prevent problems. It is really only for very large restorations that this problem may still occur. For bigger restorations we recommend you consider a porcelain inlay. Finally it should be mentioned that earlier composites contained materials thought to have oestrogen mimicking properties. Modern composites have a very different make up from these earlier materials so that this is no longer deemed to be an issue by the Dental Profession, Manufacturers and Regulatory Bodies. However, manufacturers of composite follow industry standards of good practice and constantly assess and reassess the suitability of the materials used in the manufacture of composites and all of the other items they produce. Porcelain inlays are made outside the mouth and baked in a furnace in the dental laboratory. This makes them very strong and hardwearing. To make a porcelain inlay we first remove your old amalgam filling using the protocols described elsewhere on the web site. An impression of the tooth is then taken and sent to our dental laboratory. In between visits we construct and fit a temporary inlay to your tooth. On returning to have your inlay fitted we remove the temporary inlay. The final porcelain inlay is then cemented into your tooth. The porcelain is hard wearing and has a very thin layer of adhesive cement which means there are no issues with shrinkage of the material as it sets. There are other advantages to porcelain inlays. Teeth that have had large amalgam fillings present for a number of years often have extensive cracks present too, we can often design your inlay to protect the tooth and stabilise many of these cracks to prevent them from progressing further.